After way too long an absence from the ambient music scene (her last release was 1999's brilliant From the Dark Earth), Meg Bowles has made her triumphant return with A Quiet Light, and she has not missed a beat. If anything, her time away seems to have sharpened her focus and increased her ambient and spacemusic chops. A Quiet Light is an excellent album and heralds Bowles reemergence into well-deserved prominence as not only one of the few women recording and releasing ambient and spacemusic but as a major player in the arena as well. 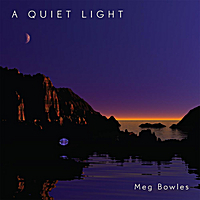 Fans of her last two releases, Blue Cosmos and the aforementioned From the Dark Earth will recognize some of Bowles' signature touches scattered throughout the six tracks on A Quiet Light but there are plenty of new wrinkles here as well. The CD is superbly engineered by the artist's husband, Richard Price, who also co-produced the album. The sound is sumptuous yet subtle, full of nuance if listened to intently on headphones; but the CD is equally enjoyable (as all good ambient should be) played in the background during quiet times of relaxation or contemplation. Bowles drew inspiration for the music on A Quiet Light from her fascination for "liminal space" which, for example, is typified by the threshold we cross as day becomes night and light changes our perceptions of our surroundings. She refers to these times as "...moments of pure grace, where one can suddenly become transported into a greater, deeper reality that exists parallel to, yet outside of, ordinary awareness." Track titles paint an accurate picture of the music contained on the CD: "Nocturnal Flight," "Forest Glade," "Beyond the Far Shore," and "A Quiet Light," to name four of the six selections. The mood is equal parts serene and mysterious, haunting but not dark or foreboding except in the subtlest ways. To say the music has a fluid quality is understating the case, as Bowles’ synth washes, pads, and chords seem to flow and ebb with an almost organic sensibility. The opening Nocturnal Flight opens with expansive synthesizer textures flowing into each other and breaking apart (sampled overtone vocals are understated). Sparse bass notes provide counterpoint to the sustained tones and warm drones/washes. Very slowly over the twelve-minute track, the bass notes begin to accelerate in tempo until a distinct midtempo beat is achieved, accented by a series of bell tones, while the main synth melody begins to attain a more specific sensation of flight and soaring, hence the cut's title, obviously. Glacial Dawn, which is next, also merits its title as the drones and textures evoke barely any movement whatsoever as well as containing a perceptible element of "cold (despite the presence of some synth chorals in amidst the assorted other sounds). A crescendo effect at the six-minute mark seems to convey the moment the sun finally appears in full above the icy blueness of the glacier. Forest Glade opens with music that may evoke emerging from an arboreal landscape into a clearing. The subtle enhancement of the introduction of what sounds like running water, accompanied by gentle organ-like tones, paints the track with an especially lovely pastoral calmness. As with “Nocturnal Flight,” after about four minutes, Bowles introduces an overt rhythmic element, this time a series of sequenced notes, laid over the lone and forlorn sounding lead synth line (which has a strong horn-like characteristic). “Chant for a Liquid World” introduces fuller synth chorals and even a solo vocal line, sung in a distinctly church-like fashion. These angelic voices are counterpointed at the outset by an assortment of burbling sounds which eventually dissipate and are replaced by overlapping synthesizer tones, washes and textures. I could continue describing the remaining two tracks (Beyond the Far Shore and A Quiet Light) but by now you should have an accurate picture of what the album holds in store. Bowles excels at crafting long ambient pieces (the shortest selection is 8:22) that evolve over their running course, but in such gradual ways that, while the changes are perceptible, they are never in the least bit jarring. Her juggling of the various layered synthesizers is formidable and displays her supreme artistry. A Quiet Light heralds Meg Bowles return to prominence in ambient and, in particular, the subgenre of classic-era spacemusic. I frankly can’t think of a more essential album to buy this year than this one.